A Northern California sheriff is harshly criticizing President Barack Obama's approach to illegal immigration after the recent fatal shootings of two deputies, just as the president announces his own executive action on the issue. Sacramento County Sheriff Scott Jones vowed to crusade against illegal immigration after the shooting rampage last month by a Mexican man with a long criminal history who was in the country illegally. Jones said any national immigration policy must start with securing the nation's borders and should not include amnesty or deferred action for those who are in the country illegally. He also blamed the president for what he termed "the hands-off'' immigration policy adopted by federal agencies. The White House did not respond to a request for comment Thursday. In a prime-time address Thursday night, Obama is expected to announce an executive order that would allow about 5 million immigrants to remain in the country. The vast majority of those would be parents who are in the country illegally but whose children are U.S. citizens or permanent residents. The man charged with killing the two deputies is the type of immigrant the Obama administration has worked aggressively to deport. The administration has had more than 2 million deportations, with a priority on deporting anyone who poses a public safety threat or has a serious immigration history. In his eight-minute video, Jones sits behind a desk in uniform, an American flag by his side. He says he does not directly blame Obama for the deaths last month of Sacramento County Sheriff's Deputy Danny Oliver or Placer County Sheriff's Detective Michael Davis Jr. A third deputy and a bystander also were wounded. But he said the shooting suspect, Utah resident Luis Enrique Monroy-Bracamonte, had been deported four times – twice more than previously disclosed by U.S. Immigration and Customs Enforcement. Monroy-Bracamonte and his wife, Janelle Marquez Monroy, have not yet entered pleas to multiple charges, including murder. Jones lauded California's large and productive population of immigrants who are in the country illegally and said he is not anti-immigration. But he said that population also includes criminals. 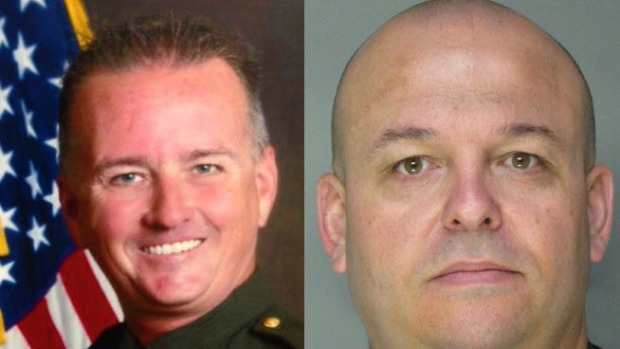 Two sheriff’s deputies, one from Placer County and the other from Sacramento County, were killed in the line of duty following a chaotic manhunt. Both suspects are behind bars but plenty of questions remain, especially what sparked the carnage. NBC Bay Area’s Cheryl Hurd reports from Sacramento with the latest from where it all started. "Like their American criminal counterparts, they commit murders, sexual assaults, kidnaps, thefts, engage in violent gang activity and murder police officers. The problem I have is I can't tell which ones are good and which ones are evil, and neither can you. By their very definition, they are undocumented, untracked, untraced and unaccounted for,'' he said. Jones is wrong to use the actions of one person to tar other immigrants, and he is wrong to say that Obama has done little to enforce border laws, said Jorge-Mario Cabrera, spokesman for the Coalition for Humane Immigrant Rights of Los Angeles. The organization has previously criticized the president for going too far in deporting immigrants. "Deporting people massively is not the answer, criminalizing everyone is certainly not humane or practical, and blaming everyone for the actions of one person is certainly unreasonable, to say the least,'' Cabrera said, although he said he understood Jones' anger over the death of his deputy. Jones urged other law enforcement officials to join him in posting similar videos in an attempt to influence immigration policy. His video had been viewed nearly 26,800 times by mid-day Thursday. In Arizona, Maricopa County Sheriff Joe Arpaio last month also used the deaths of the two California deputies to call for changes, saying his office had arrested Bracamonte in 1996 and turned him over for deportation.